As I previously wrote in Hooked Up and in my online and print profiles of 2015 Owner/Operator of the Year Heiko Lichtenberger, he was looking to commemorate his achievement with some new ink. 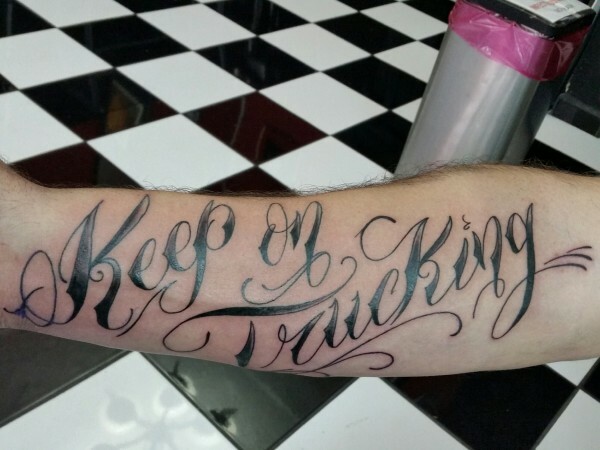 Heiko travelled to Puerto Vallarta, Mexico to have the work done and returned recently from his trip with this Keep On Trucking tattoo inscribed on the inside of his right forearm. Heiko’s not the first Truck News Owner/Operator of the Year to have a truck or trucking message tattooed on his body but he may be the first who got some custom ink to recognize the award.